M. Ian Phillips, D.Sc., Ph.D. Millions of people with hypertension take angiotensin- converting enzyme inhibitors, such as Catapres, or angiotensin receptor blockers such as Cozaar. M. Ian Phillips, an internationally recognized researcher in hypertension physiology and neuroscience, made several discoveries relevant to the early development of these drugs. 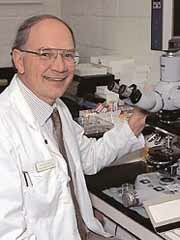 He discovered that a small protein, angiotensin, is synthesized in the brain and other tissues. Angiotensin had previously been considered to be made in the blood only, where it constricts blood vessels. By demonstrating that the peptide was also made in the brain, kidney, blood vessels and heart, independent of the angiotensin in the blood, Phillips and colleagues opened new ways to treat and understand hypertension and cardiovascular disease. He showed where and how drugs inhibiting excess angiotensin could work. He developed sensitive chemical and behavioral assays for angiotensin. In papers published in prestigious journals, including Nature and Science, Phillips demonstrated that angiotensin acts in specific parts of the brain to alter blood pressure and contribute to high blood pressure. He showed a role of the brain in hypertension. Phillips was the first to propose gene therapy for hypertension. In the last five years he has developed the scientific basis for a gene therapy approach toward treating hypertension and heart attacks. He has pioneered a technique for inhibiting the production of peptides called “antisense,” which use a specific DNA sequence in the reverse direction from normal. This antisense sequence works precisely by reducing the synthesis of a designated protein, such as a receptor or enzyme. Phillips showed that this approach is effective in models of hypertension and reduces blood pressure for prolonged periods with a single dose. His goal is to produce a one-shot treatment for hypertension with antisense DNA delivered by the adeno-associated virus developed at the UF Gene Therapy Center. Phillips’ research has been recognized by several awards including a MERIT Award from NIH. Phillips has two other NIH grants and a prestigious Howard Hughes Medical Institute Research Resources Program grant.